Do you like stovepipe hats and waistcoats and muttonchops? How about muskets and pistols and Mount & Blade: Warband? Good news, then: the L'Aigle mod transforms Warband into Europe in the early 1800's, battleground for the war of the Fifth Coalition between Napoleonic France and the Austrian Empire. The mod has just seen its first release, and by no means is it completely done, but it's in a playable state so interested parties can have a romp around Europe and get into the usual scrapes, though instead of swords and axes, you'll have pistols and muskets and swords and axes. Not to mention, a plethora of period wardrobe. Waistcoats, tailcoats, basket hats, stovepipe hats, straw boaters, and just about anything a proper gentleman needs to outfit himself before riding his horse out of Paris, getting walloped by a crowd of duffers, and getting dragged around in manacles for a week. Hold everything. This is gonna take a while. I spent some time playing it, and immediately wound up in fisticuffs with a waistcoat-wearing top-hatted mustachio'd gentleman in London who called me all sorts of names. He was working quite hard to convince me it was Europe in 1809, and you know what? He succeeded. That he did. Well, am I a rat or a dog? This is also the first mod I can think of where it's actually worthwhile to stroll around in the streets of the cities you visit. Typically, I just hit the traders and speak to whomever is running the show, but there's been some nice work done on the actual city interiors I visited (Paris and London). The mod, when complete, will have a number of factions to choose from, like France, Britain, Austria, Spain, Russia, and Prussia. 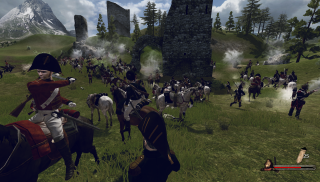 New battle formations, military ranks, naval battles, and historically accurate battle regiments are also on the roster. There are bugs, of course, as you'd expect to find in an unfinished mod, such as when I chose to fight a custom battle and all my troops spawned weaponless, horseless, and, well, everything-but-shorts-less. That was just once, though, in the rest of my battles everyone has shown up in proper attire. We did not win this fight. You can download the mod right here, along with its first two patches.